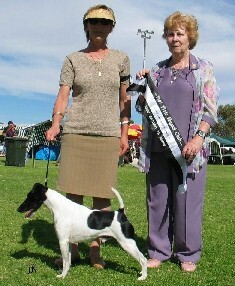 Multi BIS/BISSAust/Am Ch Tribalfox Coronado - Top Dog (all breeds) in South Australia for 2005 in accordance with the OzDog Pointscore System. Ms D Cuthbert - Bull Terrier Specialist - "Absolutely Stunning!!!" Mr Tony Johnson (WA) - "Stunning head piece"
Mr Andrew Burt (VIC) - "He's a classic dog"
Cory was earmarked at age 5/6 weeks. From the moment Jim Bass and Ken Adcox sent us photos, he just had to come here. A hard decision and under great pressure, Jim and Ken acquiesced and let Cory come to live with us after they had finished showing him in the States. Cory is the result of combining Grenpark, Graebrook, Blackfox, Son Es, Swan Lake, Tribalfox and Accolade bloodlines together, the end product speaks for itself. Cory joined our kennel in May 2004. His first show out from quarantine resulted in a BISS win. Cory has since accumulated quite a few awards - as listed above. Needless to say his Australian title and Grand title came to him very quickly and easily. Cory's first progeny in this kennel are now nearly 3 years old. He has been bred to Ch Blackfox ThBitch is Back, Blackfox Party Girl, Blackfox Lou Lou, Ch Accolade Opal-Rose and Ch Mirolinda Hot Gossip. 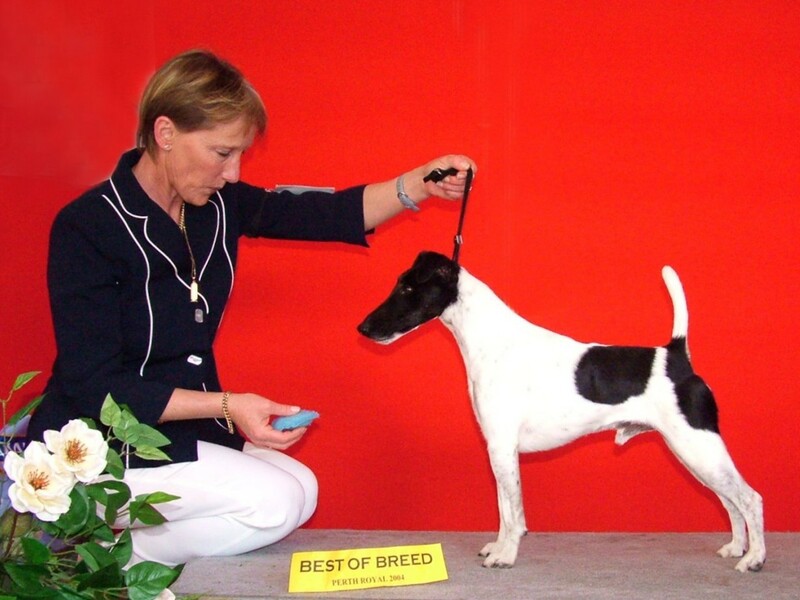 Cory is a Multiple BIS & BISS Winner and has joined the elite by attaining the status of Australian Grand Champion and is the first and only Smooth Fox Terrier in South Australia to do so. 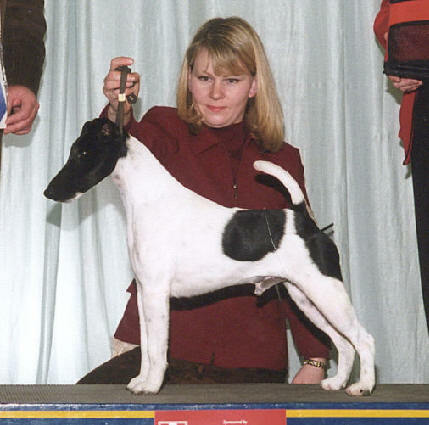 Cory has to date produced 20 champions, among them are Am Ch Swan Lake Heiress of Tribalfox, Ch Mirolinda Star Wars, Ch Mirolinda Hot Stuff, Ch Mirolinda Hot Spur, Ch Mirolinda Hot Toddy, Ch Mirolinda Piping Hot, Ch Blackfox Anais Anais, Ch Blackfox Eden, Ch Blackfox Dante, Ch Blackfox Pure Poison, Ch Blackfox Hoodoo Voodoo, Ch Sunfox Rockafella Star, Ch Sunfox Movie Star, Ch Sunfox Atlanta Star, Ch Sunfox Matinee Star (all from one litter), Ch Graebrook Rodania, Ch Graebrook Rifaria, Ch Graebrook Ms America Pie, Ch Graebrook Steely Dan and Ch Graebrook Shimera. It is with a sad heart that I place Cory in this section of my website. I have tried to find the right words to write here to do Cory justice, but realise I do not have to. Cory's illustrious show career and his quality progeny speak for themselves. Cory was taken from me on 9 February 2007 as a result of killing a brown snake and in the process, being bitten himself. He passed away peacefully in my arms and left a huge hole in my heart.